Scientists have detected the most distant star ever viewed, a blue behemoth located more than halfway across the universe, and named Icarus. Washington: Scientists have detected the most distant star ever viewed, a blue behemoth located more than halfway across the universe and named after the ancient Greek mythological figure Icarus. Researchers said on Monday they used NASA's Hubble Space Telescope to spot the star, which is up to a million times more luminous and about twice as hot as our sun, residing 9.3 billion lights years away from Earth. It is a type of star called a blue supergiant. 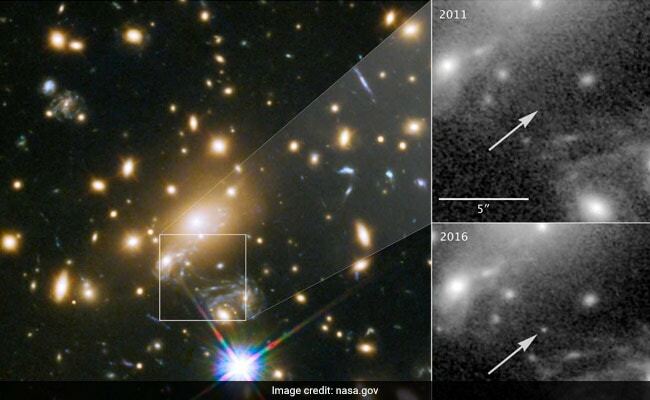 The scientists took advantage of a phenomenon called "gravitational lensing" to spot the star. It involves the bending of light by massive galaxy clusters in the line of sight, which magnifies more distant celestial objects. This makes dim, faraway objects that otherwise would be undetectable, like an individual star, visible. "The fraction of the universe where we can see stars is very small. But this sort of quirk of nature allows us to see much bigger volumes," said astronomer Patrick Kelly of the University of Minnesota, lead author of the research published in the journal Nature Astronomy. "We will now be able to study in detail what the universe was like -- and specifically how stars evolved and what their natures are -- almost all the way back to the earliest stages of the universe and the first generations of stars," Kelly added. Kelly said he preferred the nickname Warhol, after the American artist Andy Warhol, owing to the star's "15 minutes of fame" following its discovery. "No one liked that, except for one other person, so it ended up Icarus," Kelly said.